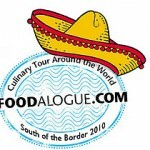 Joan from Foodalogue is having a “Culinary Tour Around the World” and this time she is going “South of the Border”. The first country on the tour is Mexico and because I love their food so much, I decided to join her with these delicious Chicken Tacos with tomatillo salsa. They were easy and quick to make and full of flavor. You can make the tomatillo salsa one day before and use leftover chicken. One of my favorite Mexican foods are tacos, so I was inspired to create these traditional Mexican Chicken Tacos with my own twist. 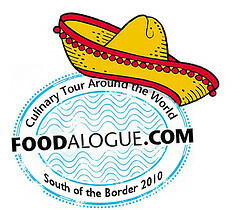 Visit Joan at Foodalogue for the itinerary and join us on this virtual culinary tour. lace the chicken stock in a sauce pan, add the tomato paste, cumin, chili powder, and oregano. Bring to a boil, then reduce the heat to medium and add the shredded chicken. Season with salt and pepper, cook for about 3 to 5 minutes. eat the tortillas on a nonstick skillet, then wrap them in aluminum foil to keep them warm. o assemble: spread one tortilla with sour cream, then top with chicken, tomatillo salsa, avocado and queso fresco. Season with salt and pepper to taste and serve with lime on the side. Repeat the process with the remaining tortillas or just let every person assemble their own taco. Thanks for joining the ‘tour’. I love that you used queso fresco and tomatillo salsa. Looks delicious — and served with that little piece of lime is just perfecto for a squeeze before biting! It looks delicious Erica. I’ve never tried the queso fresco before. It looks so pretty on the tacos 😀 Glad to be back. I finally got my computer working again!! I love the fresh, bright flavors in these tacos, and Queso Fresco is really the perfect finish! Delicious! Extremely delicious Erica. Tacos de pollo is one of my favorite. Muy bien! What a beautiful taco you have created. 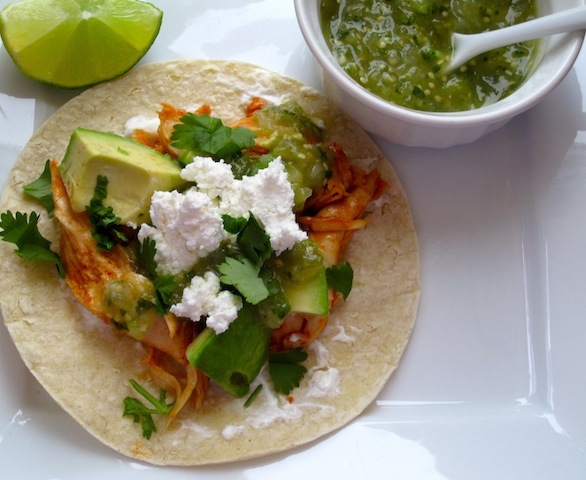 Oh my, love tacos and here’s another delicious recipe idea you provided that I must try! Yahoo. Excellent tacos, I love the queso fresco here! Those chicken tacos are making me want to go cook at 10:45pm. Great post, Erica! Thank you all for visiting and for the wonderful comments! MMMMM,…I love these yummie filled taco’s!! This sounds like a super fun event! Thanks for sharing it with us. I will definitely try to participate. And what a great meal. Chicken tacos are so good. These look especially delicious though! Everyone loves tacos! Yours are so fresh and colorful. 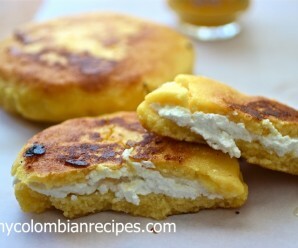 Love the addition of cumin and the queso fresco is perfect on top. They look so fresh and delicious! I need to stop reading your blog before I go to bed because my tummy protests that it really needs to eat 🙂 Love the sound of tomatilla salsa, I don’t think I’ve ever met a tomatilla before, sounds very interesting. They sound amazing. I have wanted to try tomatilla salsa and don’t need to head on a plane south of the border to give it a try. Lots of fresh flavors here and your photographs are gorgeous. I saw your tacos on Joan’s Foodalogue and wanted to stop by and say hello. OMG – those chicken tacos just look simply amazing. Just found your blog and so glad I did! Those tacos look delish, I’m going to have to try them sometime soon. I linked to your blog post about Pionono today in my post. Cheers! Love the look of the salsa….and the tacos too! Mmmmm 🙂 We have been on Chicken Taco binge all last week (me and my DD).. Love this version too, esp the salsa. Hi Erica! 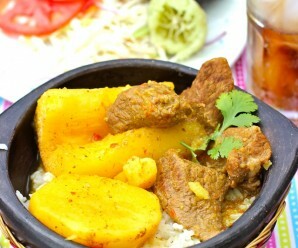 I like your website and have tried several of your recipes and have enjoyed them all. 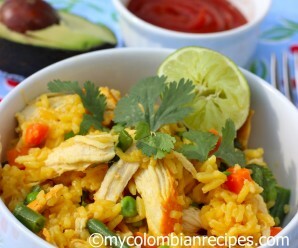 Just wanted to let you know that… I clicked on Arroz de Jamaica recipe and the Chicken Taco recipe came up instead. 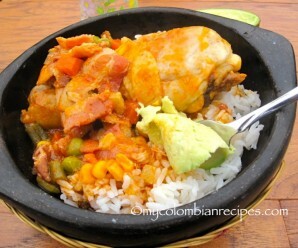 I am interested in seeing the Arroz de Jamaica recipe, if it still is available. Thank you! Hi & thanks for the heads up! We’ll get that fixed tomorrow, sorry for the inconvenience.